Meet muslin #2, the even more Frankenmuslin. I hacked apart (traced) the top from the Marfy 3367 muslin because it had two darts and my self-drafted bodice had eight darts and in sewing darts math 2>8. I hope. I chopped the same number of inches from the top of all seven (seven.) skirt panels. Which I shouldn’t congratulate myself on so much, except that I really effed up the measurements at the hem (like 3 inches different in some places), so I consider even tops a small miracle. 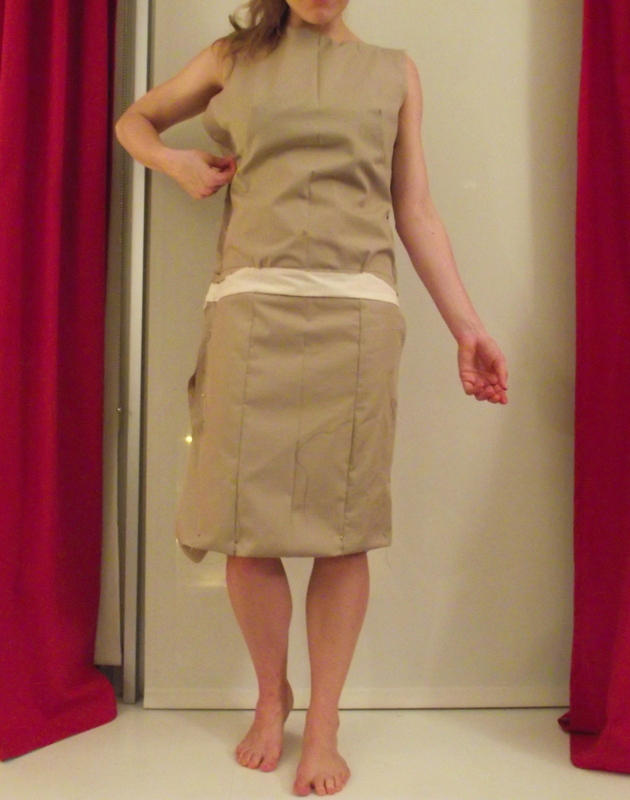 I had to make two iterations of the waist band here, but other than that the whole thing went together really quickly. Skirt looks just fine to me — I can work on length and godets later. 1. Is the waist band too low? Should I lift the whole thing up half an inch to an inch? Or maybe I should just make a taller (wider? how do you say this?) waist band. Right now the waist band is 2 inches + seam allowance, so 2 inches show. Maybe 2.5? 2. Is the top blouse-y enough? This muslin fabric is stiff cotton/poly super crappy sheet material (bought when I didn’t think I needed jersey knit sheets for this project), so it’s not flowy at all, but I’m a little worried about the lack of drape. I mean, look at her drape. 3. There’s way too much at the top center back. About three inches too much that tapers until the circumference is just right at my bra strap. This doesn’t make much sense to me, since it’s based off of the purple dress, but some things only the gods can know. 4. The center back waist band is about 1 inch too wide at the top, but just right at the bottom. From the front the waistline does seem a bit low to me. From the side it is more as if it is a part of the skirt itself (perhaps this is also why it is too wide at the top?). I think it depends a bit on what you want with the waistline whether you should raise it. If you really want it to resemble the BHLDN dress you should definitely raise it and also make is narrower. I would make muslin #3 in a fabric that resembles the drape of the final fabric, I think that is the only way to tell whether you’ll achieve the intended effect. First of all, I think it’s great that you’re making your own wedding dress. It just makes it a bit more special and personal 🙂 When it comes to the fitting I agree with Emmely about raising the waistband. Like, let it rest more on your hips. But where-ever you but the waistband, I would make sure that it’s pretty much always horizontal to the floor. At the moment it’s tipping down a bit towards the side seams. Or perhaps you want it to tilt in some direction? In any case, just make sure that the waistband looks like it’s one smooth entity. Thanks! I brought up the waist band 1/2″ and I think it’s much better-looking now. Now, just the bodice is troubled, which was an unexpected surprise. Cross fingers it’s some relatively minor adjusting because I don’t know that I’ve got a fourth in me.